Chandler Center for the Arts is located in Chandler, Arizona in the East Valley. and hosts various events throughout the year, including plays, concerts, individual performers, family events, and free concerts. It is adjacent to Chandler High School in Downtown Chandler. From the South: Take the Loop 101 north to the Chandler Blvd exit. Turn right (east) onto Chandler Blvd. Pass Alma School Road. Turn left onto California Street into parking lot. From the North: Take I-10 east toward Tucson. Past Chandler Blvd, take Loop 202 east. Exit at Arizona Avenue. Turn left (north) to Chandler Blvd. Turn left (west). Turn right onto California Street into parking lot. From the East/West: Take US 60 to the Country Club (Route 87) exit. Turn south. Country Club becomes Arizona Avenue. Turn right (west) onto Chandler Blvd. Turn right onto California Street into parking lot. Valley Metro Rail does NOT have a station near this location. 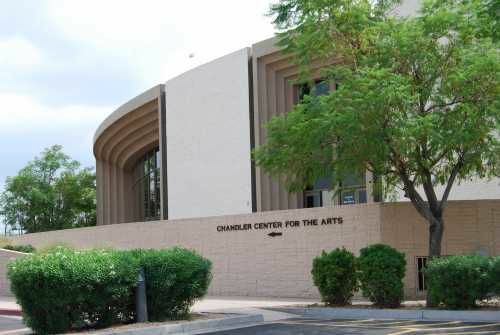 The Chandler Center for the Arts is jointly owned and operated by the City of Chandler and the Chandler Unified School District, and programmed by the Chandler Cultural Foundation, a separate non-profit corporation. In addition to providing big-name entertainment, the Center also hosts nearly 40 performing arts groups in the Phoenix metropolitan area, and prides itself on community education and outreach. Chandler Center for the Arts Box Office located at 250 North Arizona Avenue in Chandler. The box office is open Monday through Saturday. Call for hours. By phone to Chandler Center for the Arts Box Office at 480-782-2680. At Ticketmaster outlets or by phone. See the seating chart for mainstage performances at Chandler Center for the Arts. You can easily walk to the Chandler Center for the Arts from the Crowne Plaza San Marcos Resort. If that hotel is not available or not your preference, these Chandler hotels are within a reasonable drive. If you live or are staying in another Greater Phoenix community, see how long you can expect it to take to drive to downtown Chandler.